If you need to get a new IP address from a router that any iPhone, iPad, iPod touch, or other iOS device is connected to, you can either set a manual IP address or, what’s likely more relevant to most people, you’ll want to renew the DHCP lease directly from the wi-fi router itself. Renewing the lease this way should alleviate any potential conflicts with other devices on the network, and it also fills in everything from subnet mask, router, DNS settings, in addition to the new IP. Typically people need new IP addresses to get around network conflicts with other devices on the same network, though most modern wi-fi routers are much better at handing out IP’s and theoretically should never assign the same address to multiple devices. Nevertheless, it does happen from time to time even with the newest hardware and newest routers, especially if there is a lot of activity on a network. For those who repeatedly encounter the conflicts, assigning a manual address higher in the IP range than what is typically assigned can resolve that problem completely as well, you’ll probably want to check the current IP before taking a wild guess though. Renewing a DHCP lease is also standard protocol for troubleshooting a lot of network connection issues with routers and even broadband service providers, but don’t be surprised if you’re on the tech support line with a big cable or DSL provider and the only thing they know how to troubleshoot is a Windows device. Fortunately, DHCP is extremely easy to manage in iOS and after you do this once it should be easy to memorize. As usual, this same process applies to all iOS devices, including the iPad and iPod touch as well, even though the screenshots are from an iPhone. My mac and ipad and iPhone ere constantly conflicting with their ip addresses, but I didn’t get the message telling me this. Finally I discovered it myself, after months of waiting and intrigue. Instead of doing this everytime I just increased the range of ip addresses in my server. Though, if you were on a public network and couldn’t change their ip settings, this is a great troubleshoot. However, apple always says dont do this, just go to general, reset, network settings, reset : does the same job and if it is a different problem then it troubleshoots that, this only works with ip addresses. I agree with Paul. Most DHCP servers provide “pseudo-static” addressing. You’re likely to get the same address. The server will probably even “tombstone” your address for a period so you can have the same one back. I agree with the other commenters. According to the spec you should always get he same IP because your client will request the same IP as it has. As long as you haven’t changed networks or your DHCP lease hasn’t expired AND the server has already given it to another client, your IP shouldn’t change. Also, as long as you stay on the same wifi network ou should keep he same IP as the client will continually renew its DHCP itself when it’s lease time is half way up. if your mobile get wrong ip from your wifi and you can not conncet to the internet you have an app in to your that connect with anther device while using the same router. and maybe your getting the other device ip thats why can not be connect. after all you should turn on the device like iphone which was getting wrong ip. it has to be connected with wifi without any problem. Ditto, it does nothing for me on my iPhone or iPad. 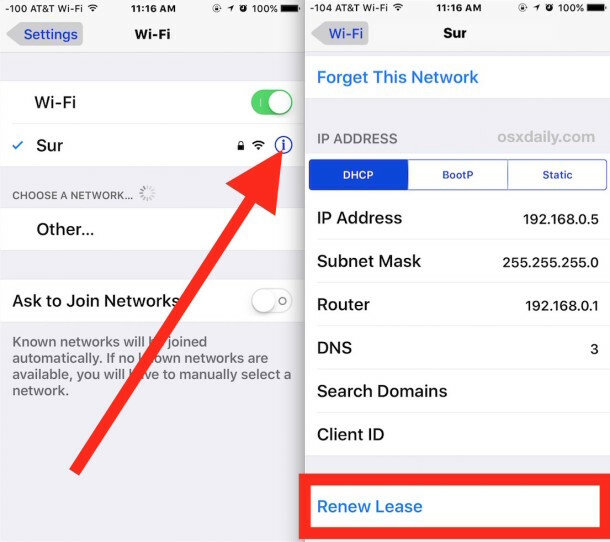 This is how you renew your DHCP lease on iPhone and iPad, it is the only way to do that as it is a network feature in iOS. Renewing DHCP lease will usually give you a new IP but sometimes the router or network assigns the same one. Stupid. This does nothing move along. Bob, this is how you can renew a DHCP lease in iOS. If your router supports DHCP and assigns new IP addresses, this is how you do it on the iPhone and iPad. I have to renew DHCP somewhat often on a network, so I am very familiar with the process. No need to condescend yourself like that, though I am sorry you feel stupid, I know that technical topics can be challenging to novice users without any techy know-how, particularly if you have never used an iPhone before like someone like yourself, is this your first cell phone? But if you just follow the instructions as written you can learn how to renew DHCP in iOS too. Wrong Bub. Does not work in 95% of cases. Clap…..clap….you can help the other 5%. I know how this stuff works trust me. Your advice is useless for most people. Move along idgit. « The Cheapest Place to Buy an iPhone 5 is Walmart: $127!